"Postcard - State Historical Library - Madison, Wisconsin - 1909. 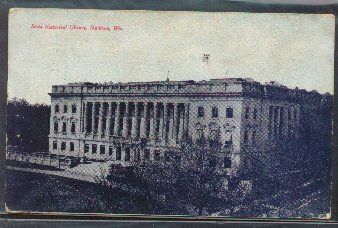 (757) POSTCARD: State Historical Library - Madison, Wisconsin-Condition: Good-. B&W Photo, 1909. Posted. Handwritten Message on back: I am sorry we are not going to get to see you. Wish you & Ma & Dad could be here it's such a beautiful city. The University Buildings are all so lovely also the grounds. Bottom right corner has been creased.Price: $4.00 + shipping.